Today seems like a good time to recap some of the features that we have added to Amazon EC2 Container Service over the last year or so, and to share some customer success stories and code with you! The service makes it easy for you to run any number of Docker containers across a managed cluster of EC2 instances, with full console, API, CloudFormation, CLI, and PowerShell support. You can store your Linux and Windows Docker images in the EC2 Container Registry for easy access. Application Load Balancing – We added support for the application load balancer last year. This high-performance load balancing option runs at the application level and allows you to define content-based routing rules. It provides support for dynamic ports and can be shared across multiple services, making it easier for you to run microservices in containers. To learn more, read about Service Load Balancing. IAM Roles for Tasks – You can secure your infrastructure by assigning IAM roles to ECS tasks. This allows you to grant permissions on a fine-grained, per-task basis, customizing the permissions to the needs of each task. Read IAM Roles for Tasks to learn more. Service Auto Scaling – You can define scaling policies that scale your services (tasks) up and down in response to changes in demand. You set the desired minimum and maximum number of tasks, create one or more scaling policies, and Service Auto Scaling will take care of the rest. The documentation for Service Auto Scaling will help you to make use of this feature. Blox – Scheduling, in a container-based environment, is the process of assigning tasks to instances. ECS gives you three options: automated (via the built-in Service Scheduler), manual (via the RunTask function), and custom (via a scheduler that you provide). Blox is an open source scheduler that supports a one-task-per-host model, with room to accommodate other models in the future. It monitors the state of the cluster and is well-suited to running monitoring agents, log collectors, and other daemon-style tasks. Windows – We launched ECS with support for Linux containers and followed up with support for running Windows Server 2016 Base with Containers. Container Instance Draining – From time to time you may need to remove an instance from a running cluster in order to scale the cluster down or to perform a system update. Earlier this year we added a set of lifecycle hooks that allow you to better manage the state of the instances. 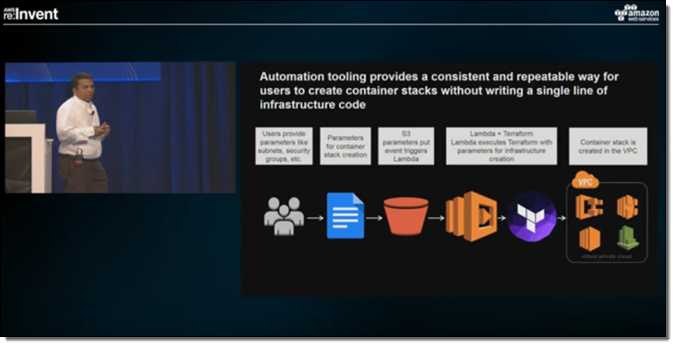 Read the blog post How to Automate Container Instance Draining in Amazon ECS to see how to use the lifecycle hooks and a Lambda function to automate the process of draining existing work from an instance while preventing new work from being scheduled for it. CI/CD Pipeline with Code* – Containers simplify software deployment and are an ideal target for a CI/CD (Continuous Integration / Continuous Deployment) pipeline. The post Continuous Deployment to Amazon ECS using AWS CodePipeline, AWS CodeBuild, Amazon ECR, and AWS CloudFormation shows you how to build and operate a CI/CD pipeline using multiple AWS services. CloudWatch Logs Integration – This launch gave you the ability to configure the containers that run your tasks to send log information to CloudWatch Logs for centralized storage and analysis. You simply install the Amazon ECS Container Agent and enable the awslogs log driver. CloudWatch Events – ECS generates CloudWatch Events when the state of a task or a container instance changes. These events allow you to monitor the state of the cluster using a Lambda function. To learn how to capture the events and store them in an Elasticsearch cluster, read Monitor Cluster State with Amazon ECS Event Stream. Task Placement Policies – This launch provided you with fine-grained control over the placement of tasks on container instances within clusters. It allows you to construct policies that include cluster constraints, custom constraints (location, instance type, AMI, and attribute), placement strategies (spread or bin pack) and to use them without writing any code. Read Introducing Amazon ECS Task Placement Policies to see how to do this! Many of our customers from large enterprises to hot startups and across all industries, such as financial services, hospitality, and consumer electronics, are using Amazon ECS to run their microservices applications in production. Companies such as Capital One, Expedia, Okta, Riot Games, and Viacom rely on Amazon ECS. Mapbox is a platform for designing and publishing custom maps. The company uses ECS to power their entire batch processing architecture to collect and process over 100 million miles of sensor data per day that they use for powering their maps. They also optimize their batch processing architecture on ECS using Spot Instances. The Mapbox platform powers over 5,000 apps and reaches more than 200 million users each month. Its backend runs on ECS allowing it to serve more than 1.3 billion requests per day. To learn more about their recent migration to ECS, read their recent blog post, We Switched to Amazon ECS, and You Won’t Believe What Happened Next. Travel company Expedia designed their backends with a microservices architecture. With the popularization of Docker, they decided they would like to adopt Docker for its faster deployments and environment portability. They chose to use ECS to orchestrate all their containers because it had great integration with the AWS platform, everything from ALB to IAM roles to VPC integration. This made ECS very easy to use with their existing AWS infrastructure. ECS really reduced the heavy lifting of deploying and running containerized applications. 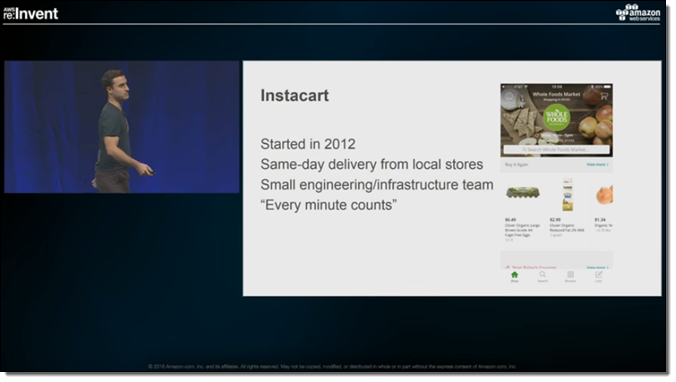 Expedia runs 75% of all apps on AWS in ECS allowing it to process 4 billion requests per hour. Read Kuldeep Chowhan‘s blog post, How Expedia Runs Hundreds of Applications in Production Using Amazon ECS to learn more. Realtor.com provides home buyers and sellers with a comprehensive database of properties that are currently for sale. Their move to AWS and ECS has helped them to support business growth that now numbers 50 million unique monthly users who drive up to 250,000 requests per second at peak times. ECS has helped them to deploy their code more quickly while increasing utilization of their cloud infrastructure. Read the Realtor.com Case Study to learn more about how they use ECS, Kinesis, and other AWS services. Rack is an open source PaaS (Platform as a Service). It focuses on infrastructure automation, runs in an isolated VPC, and uses a single-tenant build service for security. Empire is also an open source PaaS. It provides a Heroku-like workflow and is targeted at small and medium sized startups, with an emphasis on microservices. We have plenty of new features in the works for ECS, so stay tuned!